Urban agriculture is rising steadily in popularity in the United States and Canada — there are stories in the popular press, it has an increasingly central place in the growing local food movement, and there is a palpable interest in changing urban environments to foster both healthier residents and more sustainable communities. From community and school gardens in small rural towns and commercial farms in suburbs to rooftop gardens and bee-keeping operations in dense cities, urban agriculture is sprouting up across the country. 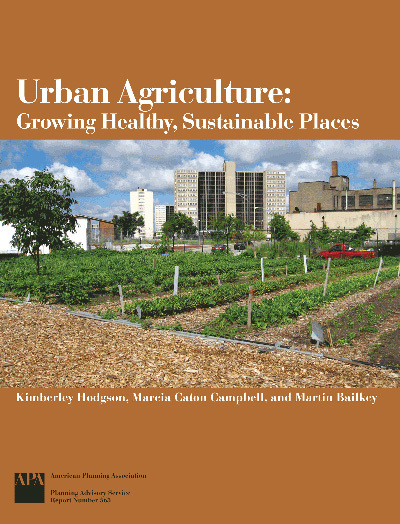 Through case studies and in-depth interviews with planners, local government officials, and urban agriculture practitioners in 11 cities across the United States and Canada, the report illustrates the range of local government efforts, policies and programs both emerging and in place, and reveals the differences among local governments in their approaches as they respond to the needs of the urban agriculture community. Case study communities included Chicago; Cleveland; Detroit; Kansas City, Kansas and Missouri; Milwaukee; Minneapolis; New Orleans; Philadelphia; Seattle and King County, Washington; Toronto, Ontario; and Vancouver, British Columbia.